Chios are semi-fat-tailed milk Mediterranean sheep. Like many breeds, the exact origin of the Chios is unknown. 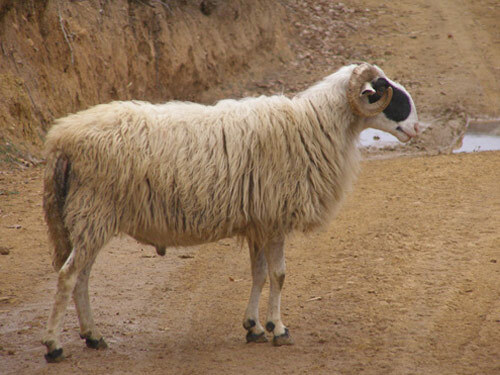 Some sources suggest it is the result of crossbreeding between local sheep of the island of Chios (Greece) and breeds from Anatolia (Turkey). The Chios is typically white with black, occasionally brown, spots around the eyes, and on the ears, nose, belly and legs. The entire head is often black. Female conformation is typically dairy. Milk production for the breed varies from 265 to 660 pounds (120-300 kg) of milk per location depending on management and husbandry conditions. The highest production recorded is 1,317 pounds (597.4 kg) during a 272 day lactation.